Ethel Plimack, who was Sunnyside’s oldest resident and cherished by many, has died. She was 107. Plimack passed away in her sleep inside her Sunnyside Gardens home on Tuesday. She is survived by three children and multiple grandchildren. Her husband, an optical supply wholesaler, died 40 years ago. Plimack, who grew up in the Bronx, moved to Sunnyside in 1941 and was active her entire life. She worked as an administrative assistant until she was 94, taking the subway to Marymount Manhattan College every day. She also swam at Equinox until she was 100. She was part of a longevity study at the Albert Einstein College of Medicine that revealed good genes, a wide social network and active lifestyle helped her to age so long and so well. Most days Plimack sat on the first floor of her 46th Street home knitting and watching TV. She was typically impeccably dressed. In recent years, Plimack had the help of a dedicated full-time aid. Plimack would knit constantly for charity sales, as well as an organization that donates caps to premature infants. She also had a strong connection to the neighborhood, having been an outspoken supporter for the landmarking of Sunnyside Gardens in the early 2000s. When she was 97, she went before the NYC Landmark Preservation Commission in Manhattan to testify in support of landmarking the Gardens. Plimack was just a few weeks short of her 108th birthday. 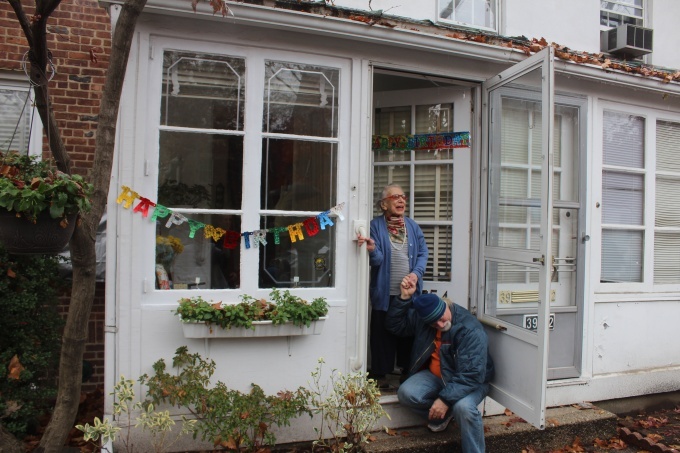 For the past five years, her birthday had been a big Sunnyside event, where residents would show up outside her house on Thanksgiving Day and sing Happy Birthday to her. More than 100 people would come each year for the 20-minute event at noon, which her neighbor, Sunnyside organizer Patricia Dorfman, arranged each year. Council Member Jimmy Van Bramer, who was a neighbor to Plimack, would always attend the birthday event. Van Bramer said Wednesday that he was saddened by her passing. Her children, all over 70, as well as her grandchildren and great grandchildren, also kept her going. “When we were kids she encouraged us to do what we wanted to do. To do what felt right,” Henry Plimack, her son and a retired audio engineer, said in 2014. Plimack’s daughter, Sylvia Plimack Mangold, is a well-known artist, whose work has been exhibited at the Museum of Fine Arts, Boston, the Museum of Modern Art, and numerous other venues. James Mangold, Ethel Plimack’s grandson, is a Hollywood director, screenwriter and producer, known for movies like The Wolverine, Walk the Line and Cop Land. Ethel Plimack attended Evander Childs High School while growing up in the Bronx. After attending Hebrew Tech in Manhattan, she became a bookkeeper and administrative assistant, working for a dress company in Queens, the New York City Department of Education, Bryant High School and P.S. 150. In the U.S., it is estimated that there are 2.2 centenarians per 10,000 people. I knew Ethel & her family since 1947 when we moved across the street, and visited her in 2001 when I was on an NYC trip from here in WI. I also saw Henry in the new millenium twice at gatherings for another Sunnysider, the late Larry Kappel. My sincere sympathy and love to all the Plimack family. I knew Ethel from the time I was 2 1/2 and we moved in across the street in 1947. I knew Sylvia, Janet & Henry as well. I visited Ethel in 2001 on a trip to NYC with my sig other, and have seen Henry twice in the last several years at functions for another late Sunnysider, Larry Kappel. My sincere sympathy and love to all the Plimack family. “People are nice and you know your neighbors.” That’s the spirit of the Gardens that I know. Thank you Ethyl for your work on landmarking and for being such a special person in our neighborhood. How about Ethel Plimack Way? Rest in Peace, Ethel. Condolences to all her family, and also to Josie Ellis who was so kind and loving to her, and who has been a fantastic neighbour on 46th Street. Rest in Peace. You will be missed! Went to school (PS 150-125) with Howard Plimack….wonder if he is related. Howard was her son. What are you like 110? I bet she had 10 dogs in her life. I bet she had a dog.